I am so very honored to announce the East’s Thrown Weapons team for tomorrow’s War Point tournament. Best of luck tomorrow; throw true! 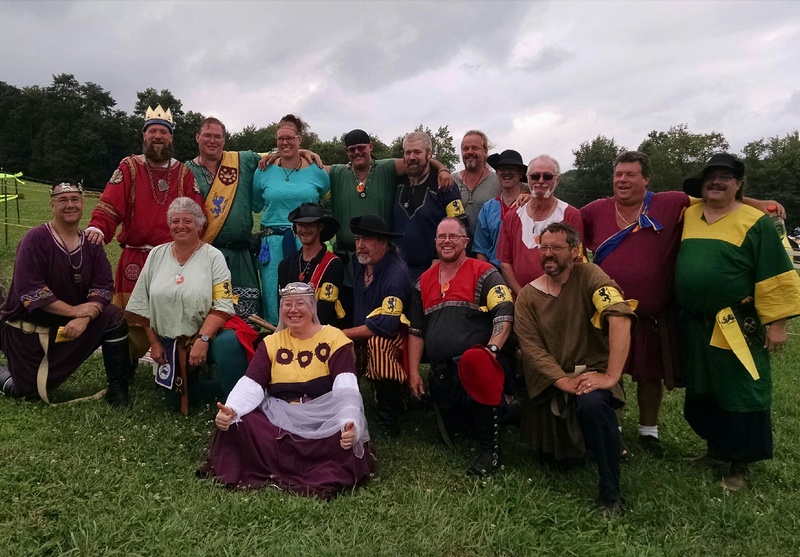 This year’s Pennsic War is a contest between the Kingdoms of the East, the Middle, and Ealdormere and their allies vs Aethelmearc and Northshield and their allies. Unbelted Champions Battle (Melee) – 40 fighters per side, worth one point. The East/Middle/Ealdormere alliance won this point. Belted Champions Battle (Melee) – 25 fighters per side, worth one point. Heroic Champions Combat – 14 single combats – 4 unbelted and 10 belted per side, worth 1 point. Rapier Champions Battle (Melee)- 20 fighters per side, worth one point. The Aethelmearc/Northshield alliance won this point, with the first two passes going to Aethelmearc. The 3rd pass was fought by the East/Middle/Ealdoremere alternates, who won. Heroic Rapier Champions (Single Combat) – 15 rapier Champions and 2 Cut and Thrust Champions per side, worth 1 point. The East/Middle/Ealdormere alliance won this point with 9 of the 17 bouts. Competition for the Populace Archery Shoot and Populace Thrown Weapons Shoot also began this afternoon. These will continue throughout the week, with points determined on Friday. The archery champions of the East defeated the Mid today, taking 2 of the 3 shoots. Complete results are below. Results provided by Mistress Ygraine of Kellswood. Edited Aug. 12, 2016 to clarify the outcome. The East emerged victorious in today’s Thrown Weapons Champions war point, with a final score of 163 to 161. Champions represented nine kingdoms, and since the Mid was unable to field a full 12 champions, other throwers were allowed to step in to complete the team. Trystan der Fackeltrayer of the Mid had the highest score, at 24 points. There was a three-way tie between William, Breccan Cu, and Bubba of Wolfhou for the second highest score, with 21 points each. It should also be reported that Princess Anna of the East was seen departing the championship with an arm full of throwing axes and a fiercely maniacal giggle. The Gazette sends its best hopes to Prince Brion. This report is courtesy of Jarl Thorson. The Gazette thanks him for his contribution. Edited Aug.12, 2016 by Ygraine to add an alternate.